Yep. We’re all children on the inside :). I find this concept illogical. Why go along with this? Isn’t it more fun to approach society at large the same way you would as a child? I like to treat society as whole as one big experiment. Disagree- A person’s level of maturity relies partially on the rate in which they adapt from previous experiences and overcome. Some don’t do so with immature child behavior and it later roots itself into ones normal moral; however, others bounce back rather swift to dwell only on short term occurrences. These prosperous people know how to direct their life choices in positive directions. Agree- We are all products of the past (children), but learn from our earlier days in order to prosper in society. We are infinitely fortunate to be assisted by our creator God. 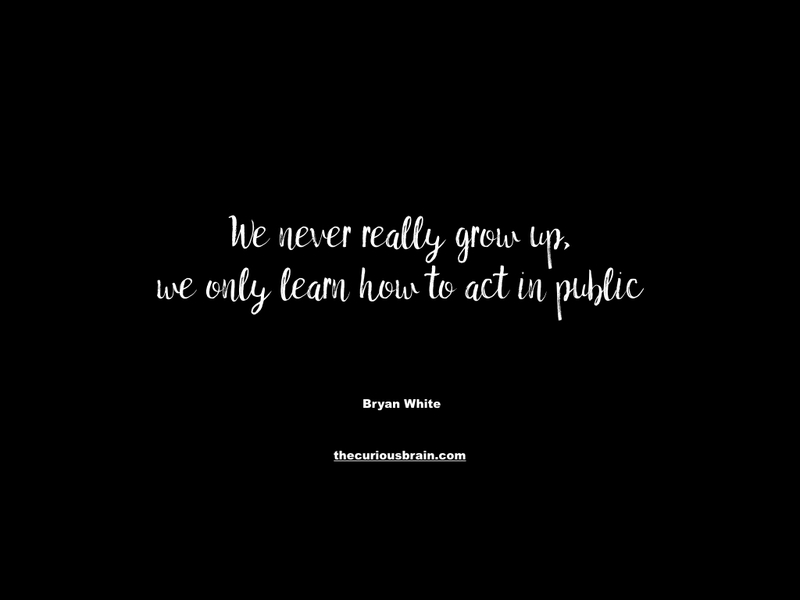 The statement: “We never really grow up……” is just a branch of the philosophy, that is, our behavior as adults, somehow in the process of growing (physically, mentally, socialy,…. you name it) we just tend to forget about the foundations of our behavior, that is, viewing the world as a child, maybe that kind of approach to life, is what you need sometimes to deal with the “grown up world”. Totally agree with that statement, and with you all. For me, that quote just has a certain kind of sweetness and innocence to it. I don’t know what it is, I just love it. It’s so true, too. adorable. this is just lovely- describes my life. Very very true!! Always a child at heart!